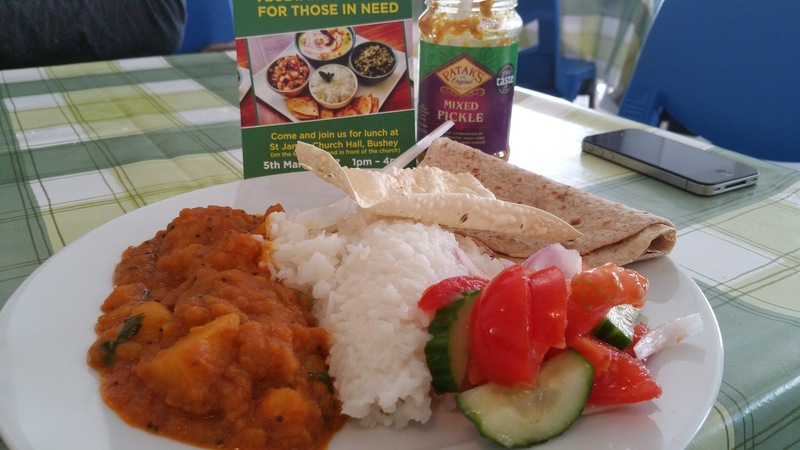 and again on the 19th March and every other Sunday Parul Joshi from Beauty Spot Watford is providing a Community meal at St James Church in Bushey. On the 5th March the initiative started. Parul has realised an ambition to be able to provide a free meal for those that need it twice a month (initially). Although Parul is passionate about assisting those who really are 'in need' she also believes that there are precious few opportunities for people in the community to come together and just enjoy eating with others who live close by. Parul is preparing and sharing a complete vegetarian meal including curry, rice, poppadoms, breads, chutneys, juice and even desserts. This is all free of charge and if you know people who are struggling to prepare a hot meal then please do let them know about this service. The food is available between 1 and 4pm on the Sunday's that it operates. If you would like to come along, obtain further information or help out in any way, please do have a look at the website below for further information. Parul can be contacted through her Beauty Spot Watford website also. Should you be blogging? ... How do you decide? ROLL UP, ROLL UP Get your Quinoa HERE! All aboard if you are Yoga Curious!